I’m just going to throw this out there. We have visited, and will visit in the future, animal communicators. I know some people believe that animal communication is possible, and others think it is a bunch of hooey. I personally waiver on the issue, however, I am willing to keep an open mind on the subject. Sometimes, while I’m sitting there across from the communicator, I desperately want it to be true. So those of you who do not believe, can read this missive, laugh and think what a crazy person I am. Those of you who believe, you’ll probably relate to what I’m about to tell you all. While I’m not entirely sure it is possible to communicate with our pets, I definitely love the idea that I might have some conduit into their mysterious little minds. At various events, we’ve probably sat with four or five different communicators in the Southern and Mid-Coast Maine area. Of those we’ve met, it seemed like two really had a connection with the kids. Everything they said had relevance to their personality or to specific events. Of the two communicators, our favorite is Sara Moore. For that reason, we’ve visited Sara more than a few times. The first time I visited Sara with Bettina in tow, I was very interested to see what Bettina had to say. Bettina isn’t shy about expressing her opinions, but usually it is via sign language or barks, growls, howls and whines. Being a fairly astute observer of my kid’s behavior I have no doubt what many of those communications meant. Still, what did she think of her new situation? What was this little black diva thinking? Typically when we visit a communicator, I have a list of specific questions I’m looking for answers to. I also check on their health status-anything hurt? Anything out of whack? Then, when I’ve gotten all my answers, I ask if there is anything that the kids may want to say/tell me. Turns out Bettina thought it was very important to let me know that her favorite color is purple. Not just any purple, but lavender. Being the true royal that she is, she demanded a lilac colored coat. And a purple collar. Oh and while I’m at it, she would also like her toenails painted purple. Huh? Who does she think she is some spoiled reality star? Still, I want to be a good mom. Plus her royal demands allow me to do something that mumma loves, make the kids fashion plates with fabulous coats and accessories. I also think Dr. Phil would tell me that it’s never a good idea to crush anyone’s dreams. Yes. That’s exactly what he’d tell me. I’m sure of it. In my best “what baby wants, baby gets” fashion, we began the search. At the Maine Greyhound Placement Service Annual Reunion, we found two purple collars. Neither were lavender but until we found the perfect one, they looked great on Bettina. Plus they were on clearance. At the fabric store I procured lavender flannel which will make a beautiful coat for my tiara wearing beast. Collar, check. Coat, check (well, sort of). That left toenails. I did some research and decided I would order her some doggy nail polish to put in her Christmas stocking. Bettina is impatient and she decided she had no intention of waiting that long. Her opportunity presented itself so perfectly, I am slightly afraid at her ability to bend the will of the universe to her own purposes. It must be her superpower. Only I’m not certain that this power will always be used for good. In fact, I’m certain it will be used for purposes that are not at all altruistic. 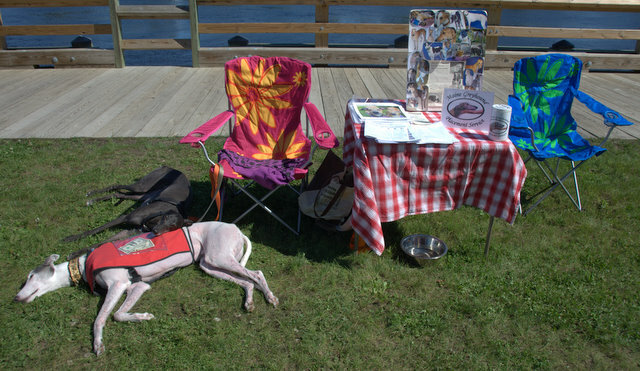 Case in point: this past weekend Blue, Bettina and I were working a Meet & Greet on behalf of Maine Greyhound Placement Service. Our table was at an annual event called Gardiner Barks in the Park. Though the day was beautiful, the festival wasn’t very busy. Our table happened to be next to the Petco grooming salon table. We had plenty of time to chat with and get to know our neighbors. Bettina waged a campaign to charm Lindsay, the grooming salon manager. She was cute and friendly and most agreeable. She was on her best behavior. I didn’t think too much on it until Lindsay kindly offered to trim and Dremel both kids’ nails since it was so slow. That is a job I definitely do not relish. Whenever I get out the nail clippers, it’s big wide eyes, big deep sighs and constant pulling away of the feet and screaming bloody murder when I haven’t even clipped anything yet. You can bet that mumma gratefully accepted that offer. Lindsay did Blue’s nails first. As usual, when your kids are in the care of strangers, Blue was good as gold. The time came to do Bettina’s nails and Her Royal Highness laid herself out, as if to provide easy access to her nails. The only thing she didn’t do was regally extend each paw. As Lindsay clipped and Dremeled Bettina’s nails, I could swear there was a little more animal communication going on there. Bettina was looking intently at Lindsay and something must have passed between them because seconds later Lindsay asked if she could paint Bettina’s nails. I explained that Bettina had actually requested this very service when we visited the animal communicator. Without blinking an eye, Lindsay asked me what color Bettina said she wanted. Her eyes lit up when I told her and soon an assistant was standing next to us with a snazzy metallic purple doggy nail polish. 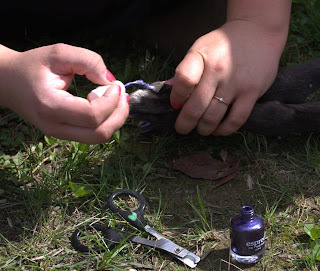 Bettina lay back and closed her eyes as Lindsay transformed her nails into her purple dream. I’m not sure there will be any living with her now that she has had her spa day. I better get busy with that purple flannel and my sewing machine. She’s strutting around the house like a small, hairy, black and purple peacock. From here on out, I’m going to rethink asking those open ended questions when we visit the animal communicator. Yes I Know My Dogs Look Funny is what I decided to name my blog when I started it. A bit lengthy. Not exceptionally catchy or amusing, I know. I tried to think of a clever, urbane, fabulous name for this repository of greyhound ramblings but in the end, I kept coming back to this. 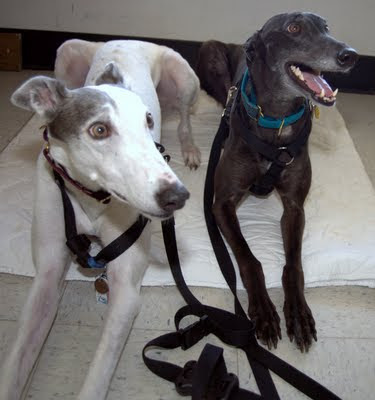 When I first got my furry children some five years ago, the greyhound rescue movement in Maine had already been in existence more than 10 years. I had been following their trajectory for at least five of those ten years, desperately wanting a greyhound of my own. Unfortunately, apartment living (cue Snoopy and the “No Dogs Allowed” song) and a busy life filled with lots of travel and long work days precluded that. The rescue of greyhounds was well established here in Maine (and probably a venerable old institution in the rest of the wide world) by the time I joined the ranks of greyhound mums and fanatics. Yet every time we ventured out of the house, we were besieged by the curious and confused. People would stop us every few feet. “Is that a greyhound? I’ve never seen one in person before.” “What sort of dog is that?” “I know I’ve seen pictures of a dog like this but I can’t think of what that is.” And my favorite, a small boy who felt the need to break loose from his mom and run across a park to ask me if I knew that my dogs looked funny? After a while I became used to not being able to walk 20 feet without being stopped so someone could see the hounds and ask questions about them. Five years ago, one person in 100 would say they had seen a greyhound before. One in 500 would say they knew someone who owned one or owned one themselves. There is no doubt that the considerable army of greyhound adopters and the well executed program of meet and greets has done an excellent job in significantly boosting brand awareness and stimulating the “I have to get me one of those” mentality. It has been a successful marketing campaign by all counts. This has led me to consider whether the name of my blog may now be obsolete. I’ve been wondering if I should change it but in the end I think not. I’ll always look back fondly on the olden times when greyhounds were a brave new world and a little boy was compelled to let me know I had some funny looking dogs, just in case I hadn’t noticed that for myself. I was browsing through Twitter, catching up on all my electronic friends’ doings when I came across a tweet from @greytfriend with a cryptic invitation to “also check out Retired from Racing, Not from Life” with a link. It piqued my curiosity so I clicked on the link. I ended up at the online store for a company called Blurb. The site lets you create amazing books and sell them if you are so inclined. Blurb goes way beyond the typical photo books you would create at Shutterfly or Walgreen’s. I even have an account with Blurb, created almost a year ago in anticipation of designing a book celebrating Girly Girl’s life. So far I can’t bring myself to sort through the thousands of photos I am lucky to have taken of her. 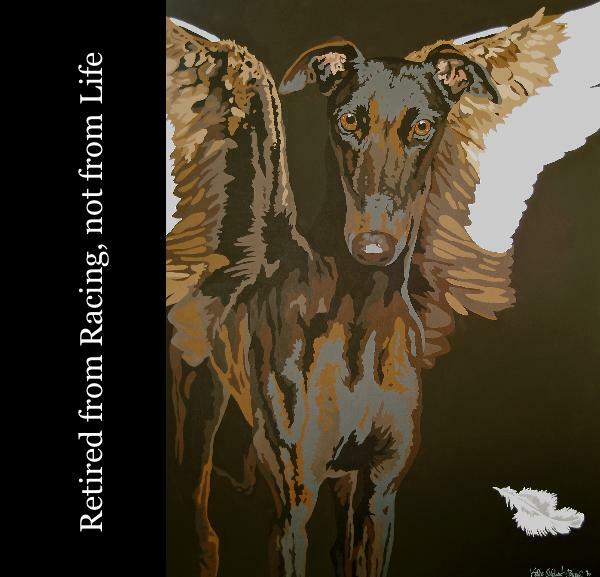 It turned out that Retired from Racing, Not from Life is a book. It was created by True North Greyhounds. This book contains absolutely incredible, stunning photos and reproductions of art work about greyhounds. All of the images were donated for the project by photographers and artists around the world. A teacher of mine once said that the sign of a good photo is when you look at it, you immediately wish you had taken it. With every photo and piece of artwork I looked at in the preview, I found myself wishing I had the skills to make art and photos like these, of one of the things I love best in the world. The sales of the book will benefit the Ohio State University Greyhound Health and Wellness Program (GHWP). This program, led by Dr. Guillermo Couto, is at the forefront of research and treatment of greyhounds. Particularly greyhounds with cancer. We first became acquainted with the program when we heard Dr. Couto speak at one of the Adoption Reunions held at the now defunct Raynham race track. Oh so shortly after hearing him speak, we were in contact with Dr. Couto and the GHWP on behalf of my heart hound, Girly Girl who fought, and lost, her battle with osteosarcoma. Throughout that still unbelievable odyssey, GHWP reviewed Girly Girl’s x-rays, confirmed her diagnosis, offered us treatment direction and advice, referrals to specialists in our area and most importantly, gave us free chemo drugs. They covered not only her first round of chemo, but also her second round. If we hadn’t needed her third round specially compounded, they would have sent us those as well. But we weren’t special. They do this for all retired racing greyhounds, at no charge. I’ve raved about this program, the staff and the services of the GHWP a couple times before in this blog. I don’t think I can ever sing their praises enough. Without the help they gave us I would probably have had to face the horrific possibility of having to let my heart dog go because I couldn’t afford treatment for her. The thought of that situation gives me nightmares still. So, as I approach the first anniversary of Girly Girl’s departure, I can’t imagine a more fitting way to remember her than by buying this book in her honor, supporting OSU Greyhound Health and Wellness Program, and letting you all know about this beautiful book that allows you to give even while you are getting so much in return. *Click on the title of this post to learn more about the book.